Sometimes you find things that make you laugh when researching. 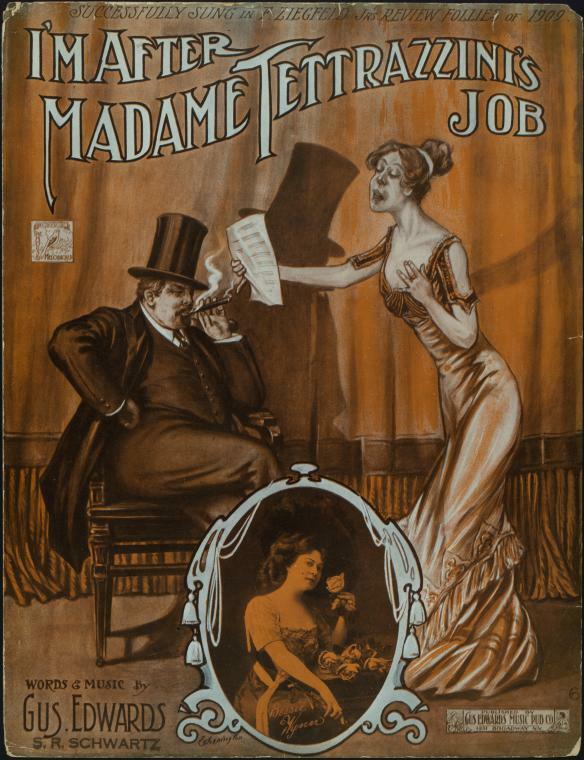 Consider the photo of sheet music from Zeigfield Follies of 1909. I stumbled upon it while looking for a photo of Luisa Tetrazzini at the New York Public Library's online digital gallery (which you can find here). My intention was to include a photo of Tetrazzini while yammering about the difference between two words: attack and onset. You know, how the word attack was used for a couple centuries for the start of the tone before the scientists among us decided onset was better. Then I was also going to steer you towards Tetrazzini's own words about the attack (which you can find here). Did you notice they misspelled her name on the cover? Bet she wasn't happy about that. You see? Names are important. You can find "I'm After Madam Tetrazini's Job" here. When my sista Tetrazin' met my cousin Carus'!" The above mention of La boheme quotes Musetta's waltz! It's oh so cute and reminiscent, I guess, of when opera and opera singers were more of an integral part of cultural life. Anyway, I thought you might get a kick out of that!!! Thank you, Bruce Sellers! This song is quite charming and funny. Made me smile. You know, a whole act could be devoted to this stuff! Of course, it would have to be performed in period dress! Yes- I got a big lick of this this. Thank you!